Wait, Ben “Yahtzee” Croshaw, the Simon Cowell video game equivalent published a book? The Zero Punctuation guy? I’m in. And really, if you enjoy Zero Punctuation there is no reason not to pick up MogWorld. Mogworld is a comedy based on the idea of interpretting World of Warcraft from an NPC’s point of view. Retails at like $6 from a comic book company. Sold yet? So that intro paragraph might have over sold the book a bit. See MogWorld is good, enjoyable, humorous but I did not find it to be a stroke of genius. But for $6, the price of a local matinee movie, hours of enjoyment are provided. Its easy to read and has some humor. 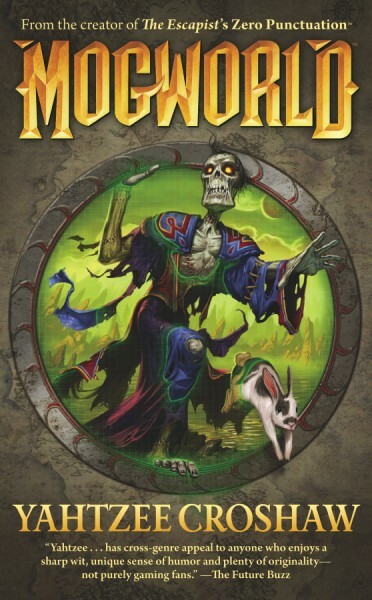 Mogworld’s plot primarily centers around the undead mage Jim’s quest to commit suicide. While that sounds hilarious, Mogworld comes across more as a book of short entertaining, mostly non-related scenes, involving Jim. The book fills almost every sentence with humor, but I never found myself doing much more than occasionally chuckling out loud. The phrase “that is so funny” comes to mind. The story starts with our unheroic protagonist, Jim, in combat school who is quickly killed and then brought back from the dead as a botched undead minion by Lord DeadGrave. Jim is joined by a regular party including the undead and overly optimistic Meryl, the terrible thief with Bob Doyle syndrome Slippery John, and undead overly righteous priest Thaddeus. And this is not to include the myriad of characters Jim encounters as he travels the land searching for a means of his demise. My personal favorite character was only briefly present at the end who I can’t help but compare to the Venture Brothers own Dr Orpheus. The problems with the book mostly lie in the repetition of the main party. Thaddeus was rather funny the first few minutes but his inability to change quickly created an annoying character. And don’t get me started on Slippery John’s speech pattern. Most of the characters in the story attempt to follow a strict character stereotype which unfortunately prevents the book from ever gaining greatness. This may have been done intentionally though since the characters are supposed to be videogame characters. Speaking of videogames, chances are if you aren’t familiar with some form of MMORPG or fantasy style videogame this book won’t have a lot for you. Many of the jokes will be entirely lost which is unfortunate since some of these jokes span the whole of the book. I read a review that claimed otherwise and while you don’t need to know what aggro is, familiarity with quest systems is integral to the experience, not to mention familiarity with how player characters act. MogWorld never quite becomes anything super special although it does take the reader for an enjoyable, short ride. A popcorn movie that was enjoyable but is only seen once if you will. Jim is a likable static main character whose spine is only physical in nature and constantly reattached. While MogWorld won’t change any viewpoints or cause mass hysterical fits of laughter, it will cause many a situation where the reader thinks to him or her self, “that’s pretty clever” or “that’s so funny”.